We have been trapped now for several days in Nassau, Bahamas, waiting for the continuous cold fronts to take a break, which should give us a weather window to proceed SE to the Exumas islands. The fronts pass over here every third day (and because of strong high pressure to the north) with strong winds clocking around 360° during one cycle. Also, the sky has been overcast limiting the visibility. The route to Allans Cay in the northern part of the Exumas chain crosses one bank with scattered coral heads less than 3 ft below the surface which requires cloudless skies for eye ball navigation. The Exuma chain provides anchorages sheltered from the east, but few with adequate protection from strong westerlies that will blow in connection with the passing of a front. So, I guess we just have to sit here and wait. We had hoped to be almost in Cuba by now. Our expensive repairs have also, regretfully, continued. 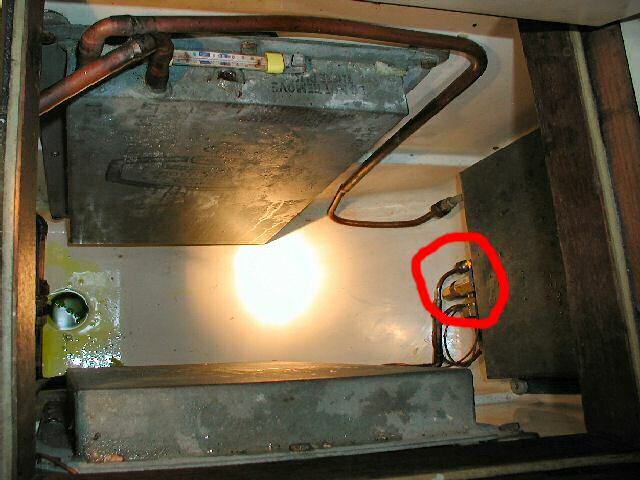 As you may remember, we had to arrange in Stuart, Florida, for a repair of a previous repair of our Grunert fridge/freezer unit. But it did not end there. I call this story “The Freezer Blues”. Having waited in Palm Beach, Florida, for a couple of days we took advantage of a brief weather window and crossed the Gulfstream to West End on Grand Bahama. This window closed the next day with strong northerly winds. Imagine my disappointment, when on the morning after our crossing, I discovered that the cooling system had broken down again! Why did it fail again, why did it not break down one day earlier when we were close to the factory (at Pompano Beach) and finally, why did the weather prevent us from returning to Palm Beach, only 60 miles away? To make things worse, we had the freezer loaded to the brim with frozen meat (from Cosco wholesale) because of our coming 3 months cruise to the out islands and Cuba. On Grand Bahama Island I could not get help from anyone. However, I was able to diagnose the problem by myself. This time the collapsing part proved to be the only vital one of the system, that had not been replaced during the two previous repairs: the 0,5 hp electric motor that drives the compressor. I called the factory in Florida; a new motor was $930 plus freight and tax. I was also informed that they have an authorized dealer and service company in Nassau. I decided that instead of having to pay for a new unit shipped to Nassau, and as I could not sail to Palm Beach under the current weather conditions, it would make sense to have the old motor repaired. Such repairs could probably not be done in more developed countries, but I guessed that in places lake the Bahamas they still know how to wind DC motors (in Cuba they certainly do, keeping those pre-Castro cars running). I might even have been able to find somebody who could do it on Grand Bahama, but sending it to the dealer in Naussau was probably our best bet. 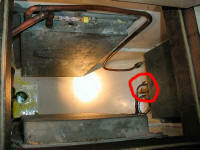 However, the installation was so badly designed that the motor was very difficult to access. I was afraid to use the force required to get the old motor out and thereby breaking one of the copper freon lines doing so. Consequently we decided to sail the 120 miles south to Nassau (instead of 60 miles to Florida!). We had an uncomfortable roller coaster sail in 35 knots of wind and huge confused seas, fortunately not on the nose. Freezing Point, the company representing Marine Air in Nassau, sent us a technician, who arrived only 4 hours later than agreed (he said we were lucky: that’s a short delay!) and quoted: $270 to get the motor out and back + whatever the company that would refurbish the motor would charge, which he estimated to be in the $80 range. As I felt that I was between the rock and a hard place I agreed. It only took him 30 minutes to get the motor out, without breaking the lines. They then kept us waiting for three days in the marina, paying $55 a day and without even being able to enjoy the town, because we were waiting for them to return all the time (“call again in an hour” etc). I wont go through all that happened during those three days, but in the end I was told on the phone, that the final price was $670 total. Their $270 plus $400 for the motor repair! I protested: their estimate had been $80. I told them to bring back the motor in the same condition that it was when it left the yacht. Impossible, it is already repaired! Again, being in a difficult position (but luckily the meat was in the marina’s freezer), I suggested a compromise of $500. The guy on the phone asked me to call again the next morning, he would check with his boss. In the morning I called on the agreed time, but only the secretary was available. I called three more times during the next hour, in vain. I also left a message to call me at the marina office. No show! Finally I throw in the blanket and phoned the dealer in Florida and ordered a new motor! I was able to get a discount from Beard Marine in Fort Lauderdale and luckily I avoided import duty in Bahamas because we are in transit (you have to fax a copy of your cruising permit to the factory and they will pack it with the other documents). But I had to pay a stamp duty of $60. The total cost for the motor shipped by Fed Ex came to $895. Together with a $50 deposit for the motor repair and the tree days of vasted docking fees I was an additional $1.100 poorer. Soon I have to start working to earning money to be able to continue cruising. It was already Friday by then and with the weekend coming up (what else is new) it took until Tuesday before the motor was aboard. We could not move away from the marina either because our meat was in their freezer. I managed to install the motor myself without causing (I think) any leaks at the freon lines. It was a very difficult task with the bolts holding the motor placed almost inaccessibly, but I have some very smart wrenches and finally succeeded (after much swearing and sweating). When “The Freezer Blues” finally was over, the weather started to deteriorate as described earlier. Right now it looks as if we may get a window on Wednesday or Thursday, but then we are already in the second week of March. Looking down into the freezer. 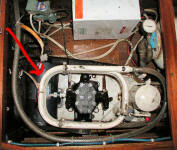 The repair of a repair was about freon leaks. Traces of freon visible around the drain.